17 day old puppies taking a nap. Huckleberry is on his back with Luna on top of him. Chase is on his side. WOW! How's it going with those 5? We adore our 2 and think that's about all we can handle, along with a cat & some birds. Guess who gets mot of the attention? We LOVE them, so adorable & funny & entertaining! Best wishes to you & yours! Wow, 5 JRT's.....you are very very brave. But, how could you resist such cuteness? 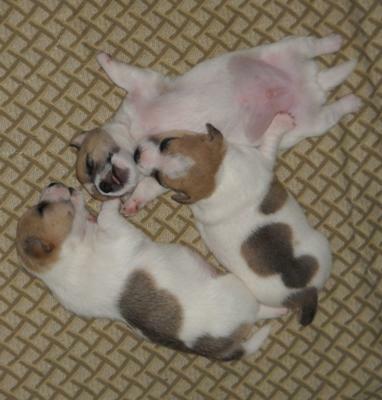 Nothing better then a little newborn puppy (times 3)!